This afternoon I hosted a free webinar in which I highlighted some of my favorite new and updated ed tech tools. During the webinar I gave brief demonstrations of Google's VR Tour Creator, Synth for podcasting, Bouncy Balls for monitoring noise, and programming augmented reality experiences through Metaverse. The webinar also included short demonstrations of Mozilla's Goggles tool, a Chrome extension to keep you from visiting Facebook too often, a tool for making animated GIFs, and how to virtually place yourself in front of any landmark. If you missed today's Best of the Web webinar, you can now watch the recording on my YouTube channel or as embedded below. The slides used in the webinar are embedded below. 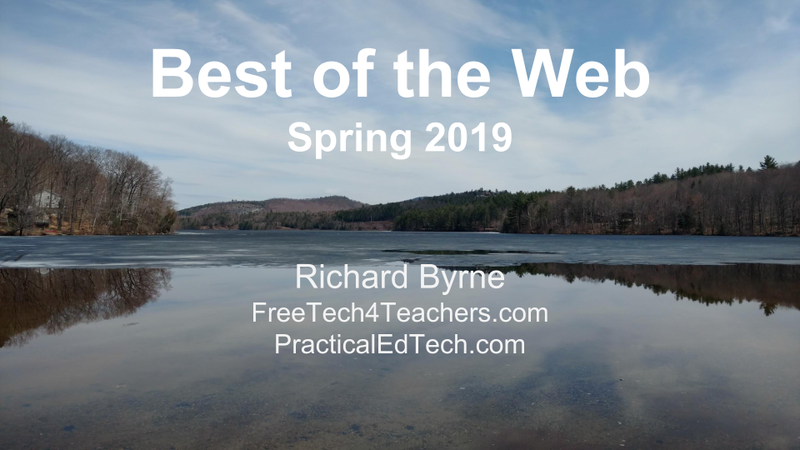 Many of the tools featured in today's webinar will be featured in greater detail in the series of Practical Ed Tech webinars that I'm hosting in April.